''Enthusiasm for postmodernism is razzmatazz,'' saith the bold Neville. ''I say that we still live in a late-modern world, developing the ideals of inquiry, humanism and community initiated in the European Renaissance, and that postmodernism is but one strand within a much larger and mixed story.'' 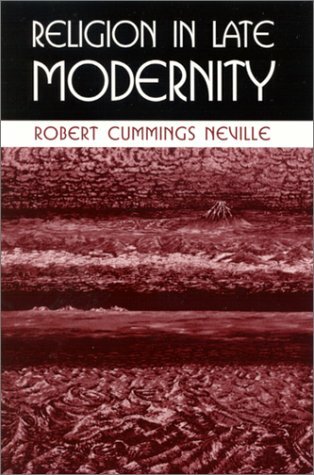 By engaging the condition of human nature, religious symbolism, concepts of God and the problem of eternity, Neville ably transitions into a discussion of religion's relationship to scholarship, society, politics, foundationalism and transcendentalism in the twenty-first century. Compiled from a number of previously published articles and Neville's most recent thought, Religion in Late Modernity declares both religion's need for a late-modern philosophy (that it might engage reality more directly) and philosophy's need to find its soul in religion ''if it is to be able to ask the great questions of being, meaning and value.'' Neville not only clearly enunciates the problem of our time but also moves us toward a substantial philosophical solution. Religion in Late Modernity runs against the grain of common suppositions of contemporary theology and philosophy of religion. Against the common supposition that basic religious terms have no real reference but are mere functions of human need, the book presents a pragmatic theory of religious symbolism in terms of which the cognitive engagement of the Ultimate is of a piece with the cognitive engagement of nature and persons. Throughout this discussion, Neville develops a late-modern conception of God that is defensible in a global theological public. Against the common supposition that religion is on the retreat in late modernity except in fundamentalist forms, the author argues that religion in our time is a stimulus to religiously oriented scholarship, a civilizing force among world societies, a foundation for obligation in politics, a source for healthy social experimentation, and the most important mover of soul.